At first I couldn't believe my eyes at intermission - indeed I had to look at my Celebrity Series program twice - the Jerusalem Quartet was really founded in 1993? What - when they were seven? Such was the youthful aura these four accomplished musicians projected in their gleaming, fashionably gray suits. My partner and I were quite sure none of them had passed the bellwether age of 30 - which explained, to my mind, the innocent glow of their playing: when the sun "rose" in their version of Haydn's "Sunrise" quartet (in B-flat Major, Op. 76, No. 4), it all but bloomed as it floated toward heaven. No one whose heart had been broken, I reasoned, could possibly play a sunrise like that. And indeed, little of the worldly edge that's habitual in Haydn performance was evident elsewhere, either (even if "allegro" to these boys often meant a breathless pace). Somehow even at top speed, however, the tone remained reassuring: the Adagio was all soft clouds of drifting mist; the Menuetto, a lilting Ländler in which you could feel the warmth of your partner's arms. Even the Finale, which integrates earlier material into a deeper, fuller dance, seemed free of shadow. But that isn't necessarily wrong for Haydn. This was the voice of the faithful Haydn, the rustic Haydn - the Haydn of The Creation and The Seasons. And it was good to get in touch with him again. Yet most of this quartet is actually well north of thirty - and moreover, as noted, they've been playing together twenty years. Which, come to think of it, perhaps explained the clean turn they made from the rosy glow bestowed on Haydn to the anxious, accusatory kick they delivered to Shostakovich's Quartet No. 12 in D-flat Major (Op. 153). Here the great Russian initially toys with a melancholy set of tone rows - which operate in a way like a sad shadow of Haydn's sunrise; but tonality eventually takes over (mostly), as tone rows can convey despair well enough, but are too abstract and feeble to conjure active malice, this composer's great theme - which tiptoes into the musical proceedings soon enough. 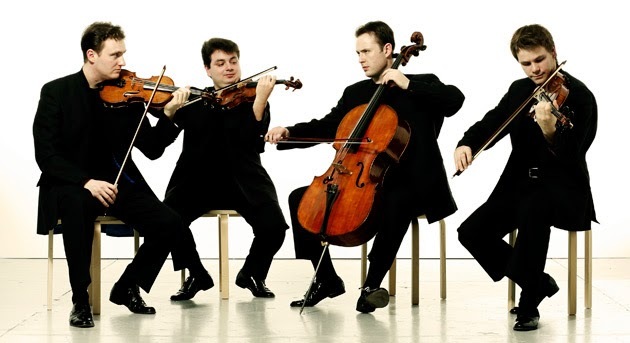 Luckily the quartet understood all this quite well, and so gave the condemnatory phrases of the Allegretto a vicious punch. The atonal asides were then served as a sort of astringent poultice to the ensuing wounds - administered along with later laments, and cut by scampering dances that were darkly mischievous in Shostakovich's peculiar way. All in all, it was a convincingly chilly and mordant performance of this late work. The quartet put on rose-colored glasses again, however, for the final half of the program, which was given over to Brahms' Quartet No. 2 in A minor (Op. 51, No. 2). And I have to admit the results were again ravishing - exquisitely balanced and focused, with a steady passion building throughout the work's substantial length. Indeed, perhaps things briefly got too passionate - lead violinist Alexander Pavlovsky snapped a string halfway through, leading to an unfortunate pause in momentum (violist Ori Kam meanwhile filled time with a light-hearted anecdote about another, unnamed quartet, and a string broken on purpose!). Still, even without this interruption, one could have been forgiven for feeling that some subtle anxiety, a certain Brahmsian angst, was this time missing from the mix. So is the Jerusalem indeed our youngest "great" quartet? Well - the crowd seemed to think so; and let's just say I wouldn't bet against them; if they lack some final modicum of maturity, that may come with time - and they have everything else in spades. And in a way, they saved the best for last, returning to Shostakovich for their encore, with the master's lustily plucked transcription of a polka from one of his own ballets. Somehow even in this miniature, the composer captured something of the pleasurable tang of cruelty - only this time with a slyly hilarious wink. It left the crowd in high spirits indeed, and crying out for still more.